Toby Jones Fishing: What time is it? A lot of you know that I work goofy hours. Well, I left for work a little early today, thinking that I was going to get there about 20 minutes before my start time. Not a big deal, I could get settled in and not be rushed before my shift starts... When I finally got to work, people started looking at me funny--which isn't all that unusual, lol. But then I realized it was not just that I am funny looking, I was actually 1 hour and 20 minutes early! Woops! Well I had a little bit of free time, and I also had a float rod in my car that I just finished building... A light bulb went off--a perfect opportunity to try it out! Down to the Yellow Breeches I went. I stopped at Rutters for a pack of worms, and hit the creek. For the first half hour all I could catch was sunfish. So, I decided to try a new spot. On my first drift at the new spot I had a nice hit, but missed him. A few more drifts and nothing... Then the last drift before I left--BAM! My float went under and I was hooked up. The fish stayed down and fought hard... I was very impressed. I didn't really expect to hook anything that would be a decent match for my 12' float rod. 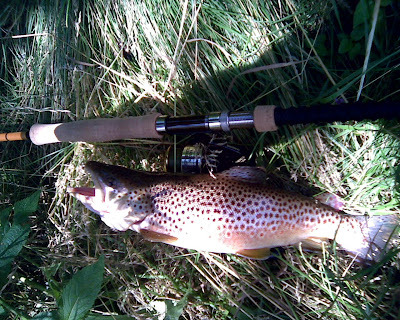 After a good fight, I brought a beautiful, male brown trout up on the bank. I'm not sure of his measurements, but I think he may have been approaching 15 inches or so. And he had a big hook jaw. I took a couple pics with my camera phone... and I apologize for the poor quality, but I'll post the best one here for you. Also, before I finish, I want to add a congratulations to my nephew Bailey. He was on vacation in the Outer Banks last week where he did a lot of surf fishing with my father and his brother Gabe. On Thursday night just before dark Bailey caught a beautiful red drum from the beach. It measured 31 inches. Congratulations to Bailey! Way to go on a beautiful fish!